Governor Ayodele Fayose of Ekiti State has declined comments on his burnt car, saying he would not reflect on the incident. Governor Fayose, who addressed newsmen in Ado Ekiti after the distribution of funds to communities in the state for development projects, deflected the question when it was asked. 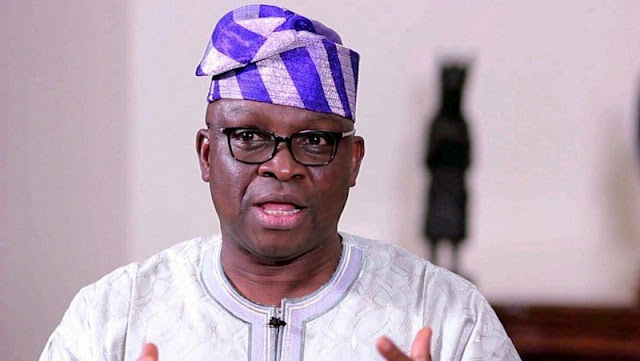 “I don’t want to comment on that,” Fayose said when asked during the cheque distribution, which was done through the Ekiti State Community Development Agency (EKCIDA) in partnership with the World Bank. His Mercedes Benz Jeep, G Wagon, got burnt at Apapa-Oshodi Expressway in Lagos State, on Wednesday, although he was said not to be in the vehicle. The governor at yesterday’s event told his supporters that the only thing he would miss after relinquishing power are Ekiti people, who gave him immense support while in office.